Biodiversity describes the variety of biological organisms in a given habitat , area, or ecosystem . It includes several components involving variation in species, ecosystems, and genetics. Species diversity is perhaps what most people think of when they think of biodiversity. Species biodiversity describes the number of different species of plants, animals, fungi, protists, or bacteria within an area of interest. Although there are approximately 1.5 million named species globally, the large majority of species have yet to be studied or named, and there are likely to be as many as 10 million species on Earth. Ecosystem diversity describes the variety of habitat types found within a given area. For example, there are numerous types of terrestrial (land-based) ecosystems in the United States, including forests, grasslands, wetlands , and deserts. There also are many types of aquatic (water-based) ecosystems, including lakes, rivers, estuaries , coral reefs, and intertidal habitats. Genetic diversity describes genetic variation within species and represents a third component of biodiversity. Genetic variation allows species to adapt to changes in their environment. Species that are reduced to very small populations lose much of the gene pool and hence can lose much of this adaptability. Aquatic biodiversity describes the diversity of species and ecosystems found in and around aquatic habitats such as rivers, lakes, and oceans. As with terrestrial ecosystems, aquatic biodiversity varies from region to region. 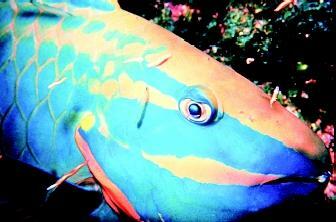 Aquatic biodiversity is greatest in tropical latitudes. For example, an estimated 3,000 species of fish are found in the Amazon River alone. Coral reef habitats also have extremely high biodiversity; nearly a quarter of all known marine species are found in coral reefs. The Great Barrier Reef, off the coast of Australia, is the largest coral reef system in the world. 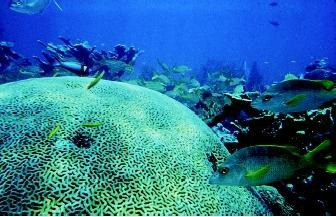 It supports over 700 species of coral, in addition to 1,600 fish species and 4,000 species of mollusks . The concept of biodiversity can be embodied in this colorful reef fish: a genetically distinct species is found in a specific habitat within a larger ecosystem. This particular fish could not survive, for example, in a polar sea or a tidal river. difficult to cross. This results in the evolution of distinct species in different fresh-water habitats. The preservation of fresh-water habitats therefore is particularly critical to conserving aquatic biodiversity. The value of biodiversity is an issue that has caused considerable debate, given that the preservation of habitats often conflicts with the desires of developers. Yet there are several reasons for valuing biodiversity. First, biodiversity is essential to the functioning of ecosystems. Each species plays a unique role within an ecosystem, and every species is dependent on others for food, shelter, or other resources. The loss of a single species therefore can have profound effects for the ecosystem as a whole. Second, all species are potential sources of genetic variation for the development of new types of agricultural crops, as well as of medical drugs for treatment of human diseases. Third, biota (living organisms) have scientific and educational value. Finally, species have aesthetic and recreational value—consider, for example, the popularity of activities such as snorkeling, scuba diving, and hiking. Scientists have shown that habitats with greater biodiversity are more resilient—that is, they are better able to adjust to and recover from various disturbances. Because different species may perform overlapping functions in a biologically diverse ecosystem, a disturbance that affects one species may have lesser impact on the ecosystem as a whole. Habitats with little diversity are more vulnerable, because a disturbance affecting one species may cause the entire network of interactions to collapse. Ecosystems approaches to natural resource management address interactions among species and among food webs , as well as the cycling of resources such as carbon, water, and nitrogen. These ecosystems approaches focus not on single species, but on the preservation of complex sets of interactions among species. Preservation of large, intact areas of habitat is necessary for the continued functioning of ecosystems. Coral reefs are known for their biodiversity as well as their scientific, educational, and recreational value. This brain coral gets its name from its resemblance to the human brain. Even a few centimeters of water can create a small habitat: in this case, a shallow coastal splash-zone pool on a rocky shore. 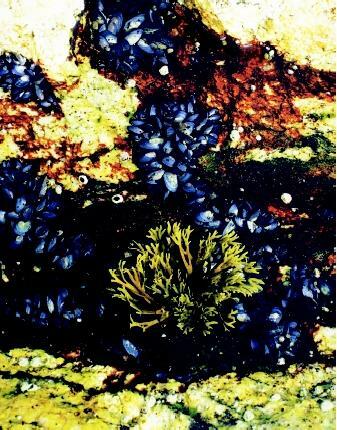 Like tidal pools, such coastal environments support diverse communities of plants and animals. Aquatic biodiversity is threatened on many fronts. Fresh-water habitats support many of the most highly threatened animal groups. These include fish, mussels, amphibians , and crustaceans . Fresh-water habitats are threatened by many factors, including pollution from industry, increased acidification, and agricultural runoff containing residues of fertilizers or pesticides . In addition, the building of dams destroys many river ecosystems. Development can harm aquatic habitats or remove them altogether, as when marshy areas are filled. Aquatic ecosystems also are particularly fragile because the disturbance of a watershed can affect multiple components downstream, including rivers, lakes, estuaries, and oceans. Perhaps the largest threat to ocean biodiversity is overfishing. In addition to depleting commercial species of fish, bivalves, and crustaceans, many fishing methods cause the needless deaths of noncommercial fish species as well as numerous reptiles, birds, and marine mammals. SEE ALSO Amphibian Population Declines ; Balancing Diverse Interests ; Birds, Aquatic ; Bivalves ; Cephalopods ; Corals and Coral Reefs ; Crustaceans ; Ecology, Fresh-Water ; Ecology, Marine ; Endangered Species Act ; Estuaries ; Fish ; Fish and Wildlife Issues ; Fisheries, Fresh-Water ; Fisheries, Marine ; Fishes, Cartilaginous ; Instream Water Issues ; Life in Extreme Water Environments ; Life in Water ; Marine Mammals ; Oceans, Polar ; Oceans, Tropical ; Reptiles . * See "Marine Mammals" for photographs of a killer whale, manatee, elephant seal, and dolphin.